The Square Mason jar is designed as a canning jar and has the graduated measurements and the word mason in raised print on the jar. This is NOT a smooth side jar. 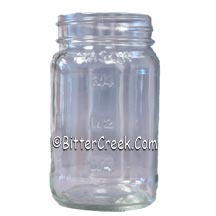 It can be used for canning (Our lids can not be used for canning) or use them for making paraffin, soy or gel candles! This jar also is great for packaging potpourri, bath salts, and more! A great look with any country or primitive line!